The Solar Ultraviolet Imager is a telescope that monitors the sun in the extreme ultraviolet wavelength range. By observing the sun, SUVI is able to compile full disk solar images around the clock. 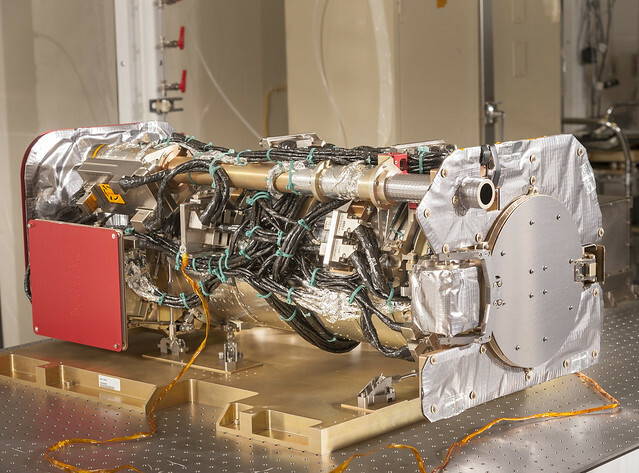 It replaces the GOES Solar X-ray Imager (SXI) instrument and represents a change in both spectral coverage and spatial resolution over SXI. SUVI observes and characterizes complex active regions of the sun, solar flares, and the eruptions of solar filaments which may give rise to coronal mass ejections. Depending on the size and the trajectory of solar eruptions, the possible effects to near-Earth space and Earth’s magnetosphere, referred to as space weather, can cause geomagnetic storms which disrupt power utilities, communication and navigation systems, and may cause radiation damage to orbiting satellites and the International Space Station. SUVI observations of solar flares and solar eruptions can provide early warning of possible impacts to Earth’s space environment and enable better forecasting of potentially disruptive events on the ground. SUVI is located on the Sun-Pointing Platform (SPP) of the satellite, which is located on the solar array yoke. The SPP provides a stable foundation and will track the daily and seasonal movement of the sun which is critical to the success of SUVI. Data from SUVI provides an estimation of coronal plasma temperatures and emission measurements which are important to space weather forecasting. SUVI is essential to understanding active areas on the sun, solar flares and eruptions that may lead to coronal mass ejections which may impact Earth. Depending on the magnitude of a particular eruption, a geomagnetic storm can result that is powerful enough to disturb Earth’s magnetic field. Such an event may impact power grids by tripping circuit breakers, disrupt communication and satellite data collection by causing short-wave radio interference and damage orbiting satellites and their electronics. SUVI helps the NOAA Space Weather Prediction Center provide early space weather warnings to electric power companies, telecommunication providers and satellite operators. Six wavelength bands observe the range of solar phenomena important for space weather forecasting.